Accept, Except. Affect, Effect. Conscience, Conscious. Each of these words sounds extremely similar to its partner but has a completely different meaning. Grammatically speaking, pairs like these can cause a lot of confusion. In the medical world, we come across similar sounding terms all the time. Imagine if care providers confused these words? If your surgeon confused your larynx with your pharynx, you could go in for voice box surgery and leave having had pharyngeal flap surgery. No one wants that. Speaking of body parts that sound extremely similar, are located extremely close to each other, and mean completely different things, let’s talk about the thyroid and parathyroid glands. Parathyroid: The parathyroid glands are 4 small glands located behind the thyroid gland. These glands produce a hormone (PTH) that helps control the amount of calcium and phosphorus in the blood. If these glands make too much PTH, you have hyperparathyroidism, and your blood calcium level rises. Your body has to take calcium from other places like your bones to regulate levels causing health problems like osteoporosis. If your parathyroid glands do not make enough PTH, you have hypoparathyroidism, and your blood has too much calcium and phosphorus. Too much calcium in the blood could result in Vitamin D deficiency and kidney issues. The symptoms of thyroid and parathyroid disease vary. If you are experiencing symptoms you think could be related to a thyroid or parathyroid disorder, visit a FastMed location near you to consult with a medical professional. 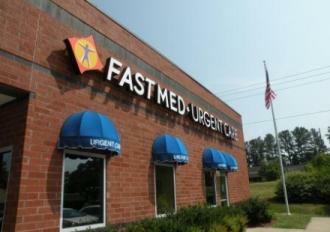 Our clinics are open 365 days a year, making it easy for you to come in at a time that fits your busy schedule.